Classic Protective Coatings is in the process of completing renovation of the 8.3 Million Gallon Ground Water Storage Tank in Colorado. Due to the vast size of the ground storage tank, CPC has chosen to utilize our FasterBlaster to abrasive blast for the exterior of the tank. 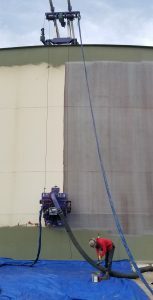 The use of the FasterBlaster will allow us to provide our customer with a uniformed blast while creating minimal dust. Once the tank is blasted it will be coated with Zinc/Epoxy/Urethane system. The interior of the ground storage tank will be sandblasted to a SSPC-SP-10 with the utilization of our ARS Recycling Machine. The ARS unit allows us the ability to reduce cost while also reducing our carbon foot print on the environment. The interior of the tank will be coated with a Zinc/3 coat Epoxy system.